The seventh Match of Pro Kabaddi league Season-6 was between U Mumba and Jaipur Pink Panthers. After the first tie in the opening game against Puneri Paltan, U Mumba came with a strong spirit to win a match against Jaipur Pink Panthers. On another face, Jaipur pink Panthers was curious to rock in their First match of the tournament. Pink Panthers’ captain Anup Kumar won the toss and selected choice of court. For supporting Jaipur pink Panthers, Abhishek Bachchan co-owner of the team with wife Aishwarya and daughter Aaradhya Bachchan came to Chennai stadium. U Mumba’s Siddharth Desai went for the first raid and started the match with a bonus point. After Seven minutes, U Mumba called for Review as Nitin was given two points for a raid but U Mumba’s Fazel believed he was out but the review was unsuccessful and 2-5 score at the table. U Mumba came back in match brilliantly after all out in ten minutes and at the halftime U Mumba behind 2 points (13-15) against Panthers. After 15 minutes of Half, Both teams levelled their score at 25-25.U Mumba put all effort to all-out Pink Panthers at score 38-30 before five minutes. And at the end of game U Mumba mark their win 39-32 against Jaipur Pink Panthers. 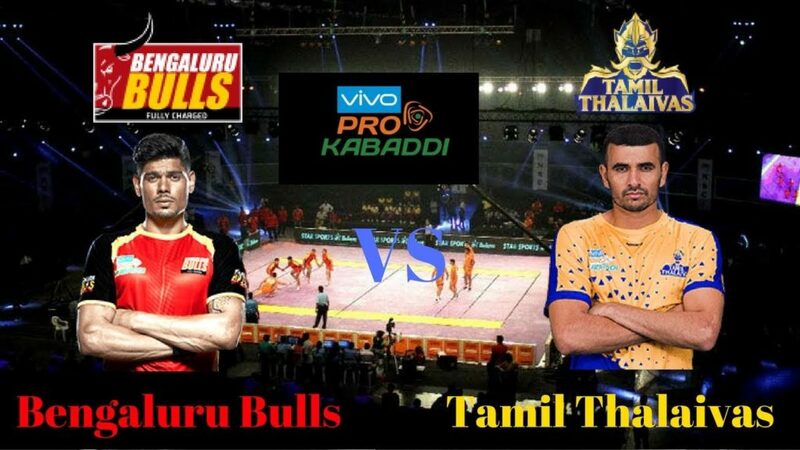 2nd match of the day was between Tamil Thalaivas vs Bengaluru Bulls. This was the fourth match of Thalaivas with only one win. Where Bengaluru Bulls played their first match of the tournament. Bengaluru Bulls won the toss and selected choice of court. In this match, the first Review was granted to Tamil Thalaivas at point 5-8. The second review was unsuccessful for Tamil and Bengaluru Bulls took bonus point in the Third review of the match. At halftime, Bengaluru Bulls lead with 17 points (12-28) scored by Pawan Sherawat against Thalaivas. Bengaluru all out at 29-42 score. Bengaluru Bulls’ Kashiling Adake scored an individual 500th point in this match in PKL. At fulltime Bengaluru bulls managed his halftime scored 12-28 to reach 37-48 on score table. Bengaluru Bulls started their First match first win against Tamil Thalaivas with 11 point lead.